Canada’s Governor General, Michaëlle Jean, broke down in tears Wednesday as she appealed from Ottawa for assistance to Haiti, following Tuesday afternoon’s devastating earthquake that has killed and injured hundreds of thousands of people and caused billions of dollars in damage. The world had already begun to show that it had a heart before the Haiti-born Jean made her plea “to show our solidarity with the most vulnerable people in the Americas, our brothers and sisters in Haiti”. Locals, United Nations workers and others began rescuing and treating the injured and the world and regional community mobilized manpower and material to begin pouring into the ravaged country. Jamaica led the Caribbean Community(CARICOM) announcing the dispatch of an army contingent Wednesday night to assist in the rescue and recovery mission. In what must come as a blessing from the calamity, Prime Minister Bruce Golding announced that he and opposition leader Portia Simpson-Miller would travel together to Haiti to get a first hand view of the magnitude of the disaster and the needed recovery – a unity of action unseen in their usual relationship and the effort required to stem an annual tide of bloody murders that stymies Jamaica’s progress. 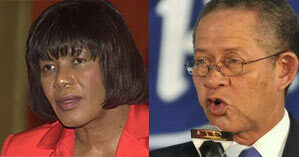 Jamaica's PM Bruce Golding (right) and opposition leader Portia Simpson-Miller. Medical and other aid will be dispatched Friday, when Golding is expeected to be part of a CARICOM team to visit Haiti. The CARICOM Secretariat in Guyana, announced that Chirman Roosevelt Skirrit, the Dominica prime minister would lead a fact finding mission accompanied by Barbados Prime Minister David Thompson, Golding and CARICOM secretary general Edwin Carrington. With members Jamaica and the Bahamas especially susceptible to receiving refugees fleeing the mayhem, Golding said his national security and health ministries reported that coastal surveillance for refugees has started offshore the islands north and east coasts and preparations have been put in place to receive, screen and treat them. Jamaica has also committed to the United Nations to provide medical services to victims of the earthquake at the country’s two main hospitals in the capital, Kingston. International news reports say the US is sending up to 3,500 soldiers and 2,200 marines to Haiti to help rescue efforts in the wake of the devastating earthquake. President Barack Obama pledged one of the biggest relief efforts in recent US history and said Haiti would “not be forgotten” in its hour of need. Two Canadian warships carrying supplies and humanitarian aid were to leave later Thursday, while two aircraft – a large C-17 and a smaller Hercules – had arrived by mid-day, the Canadian Press news agency reported and they will begin laying the groundwork for the country’s wider response to the catastrophe. If there was any fly in the ointment of the global response, it was that of the American so-called “Christian” television evangelist, Pat Robertson, who, while mobilising relief supplies, declared the earthquake was recompense for “a pact with the devil” made by Haitian revolutionary leaders to secure freedom from France and end the accompanying system of slavery. But if that be the case, that the wickedness of the forefathers will be visited on generations far removed from atrocities, real or alleged, then France and others that led the iniquitous system of centuries of slavery against worldwide communities, and people who make false declarations, had better prepare to meet their Waterloo – that or demonstrate new compassion. Visit this link to support UNICEF’s response to Haitian children in need. I urge everyone who is able, to make a contribution to the Haitian relief fund. My only fear is that after it is no longer newsworthy and most of the early responders have left, that Haiti will once more be set adrift, and all the pledges of monetary support to rebuild will evaporate in the Haitian sun.